Spy shots floating around the internet show what appears to be a Dodge Charger SRT Hellcat with heavy camouflage on the front end – suggesting that the highest performance sedan in America might soon be getting a facelift. Over the past few months, we have talked at great lengths about the future of the Dodge Challenger and while we have occasionally mentioned the Charger, America’s favorite rear-wheel-drive sedan has gone relatively unmentioned. That is about to change, as spy shots of a Charger with the front end heavily disguised have turned up online, leading us all to wonder what Dodge has planned for the high performance sedan. The spy shots traveling around the internet today appear to show a Dodge Charger SRT Hellcat in Indigo Blue with the majority of the front end covered. The fender badges are covered, but it has the same brakes and wheels as the current Hellcat Charger, along with a front-fascia hood scoop, suggesting that it is a Hellcat model. While we can’t see anything through the black cladding covering the front of this Charger, we can see that it has huge headlight openings with white mesh that wraps around to the fenders. The Charger’s current headlights don’t cover this much real estate, so the headlights are getting bigger or the contrasting white portions are designed to further disguise the form of the front end. 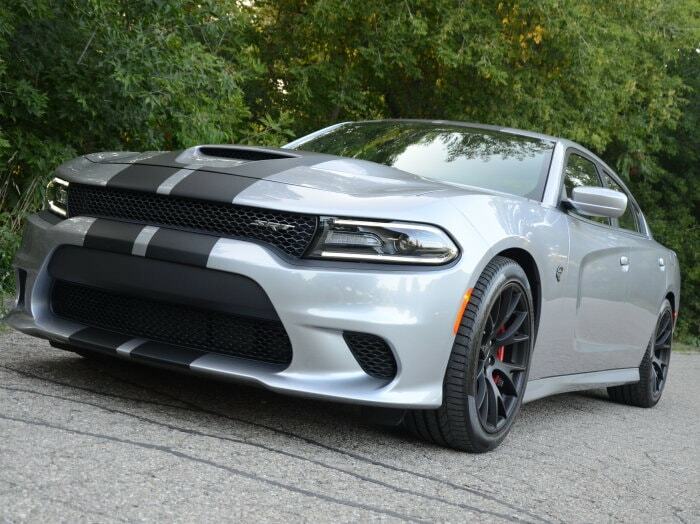 Considering how much of the front end is covered, there could be some big changes behind this camo and since the modern Charger was introduced a decade ago, it has undergone a variety of facelifts. These spy shots suggest that another facelift could be coming soon. Many of the discussions about the future of the Dodge Challenger SRT Hellcat suggest that the supercharged Hemi could – or should – soon get a little more power. With the new Ford Mustang GT500 expected to offer enough horsepower to best the Hellcat Challenger, it is expected that Dodge will fire back with a new, more-powerful Hellcat engine. Since the Hellcat Challenger and Charger share an engine, it seems likely that if the 2-door muscle car gets more power from the supercharged 6.2-liter Hemi, the sedan will as well. Then again, we already know that the 2019 Hellcat Challenger is getting a new hood and if the upcoming Charger is getting some extra refreshing as well, we have to wonder if the company will also introduce more power to go with the new look – or is the new look the change for 2019? We will likely be waiting for at least a few months before finding out, but in the meantime, we know that Dodge has something cooking for the Charger in the coming years.